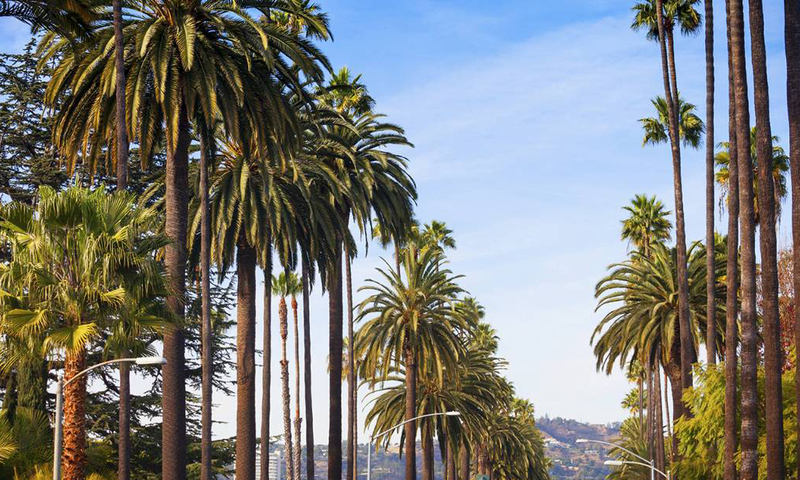 Palm-lined Doheny Drive leads us to the Four Seasons LA. Having spent the previous night camping in the Mojave Desert before driving into LA, we are more than ready for some comfort, and the Four Seasons Los Angeles at Beverly Hills takes this to the next level in every possible way. After a swift and friendly check-in, we head up to our Deluxe Executive Suite, where we’re greeted with a welcome note and a trio of cute (and delicious) cupcakes before stepping out onto a private balcony with a classic view of Downtown LA and the Hollywood sign. The suite’s spacious marble bathroom, with its rain shower option, full bath, and gorgeous skin and hair products is the ideal place to refresh after a long day. We are childishly excited by the in-mirror TV and overhead speaker system, and pad around in terry robes while we prepare for dinner. Although we have other commitments this evening, we regretfully eye the modern Italian menu for the hotel’s restaurant, Culina, before heading out. 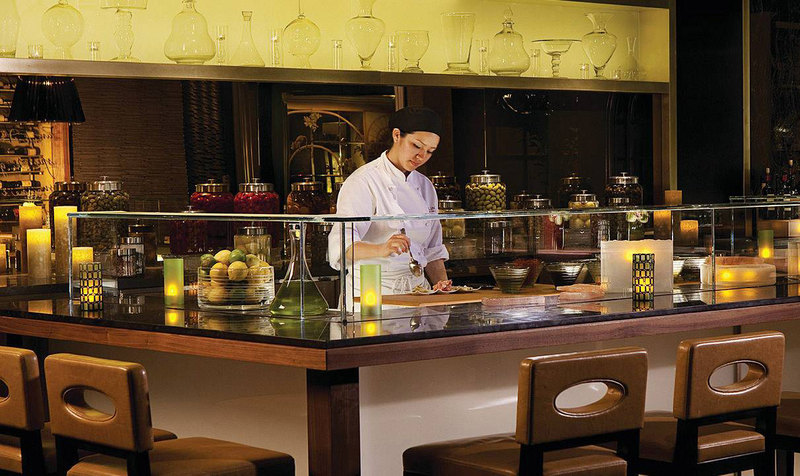 A chef assembles a dish from the modern Italian menu at Culina’s Crudo Bar. A few hours later, we cannot wait to return to the suite. Back in our robes, we relax with a couple of drinks and make full use of the living room facilities. Complimentary internet allows us to stream our music while I claim the armchair with cushy footrest and my guest stretches out on the sofa. Eventually we call it a night, and venture to bed. Now, I pride myself on the quality of my bed at home — it’s famous as the ‘cloud bed’ among close friends who have had the privilege of napping in it — but this is something else entirely. Even the pillows are amazing. We sink into a blissful sleep. 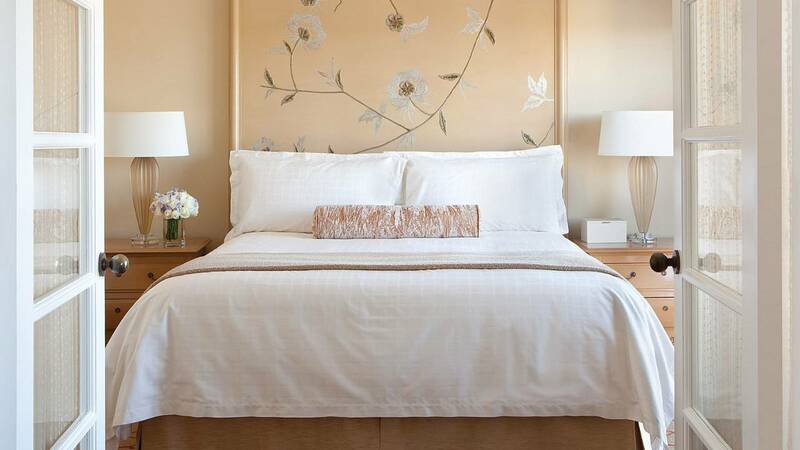 Plush bed and luxurious furnishings in the Executive Suite at the Four Seasons LA. As difficult as it is to get out of this bed, the next morning I have an appointment first thing at the hotel spa, which is more than worth the sacrifice. I can hardly wait to try the new Diamond Youth Facial, which uses a small diamond-tip vacuum to simultaneously exfoliate and infuse a plumping, clarifying serum. My facialist Megan talks me through the process as we go, warning that it may feel rough, like a cat’s tongue — which it does, though it’s not unpleasant at all. Following a firming, toning mask and a final smoothing of serum, Megan tells me that by the following morning I will see my best skin ever, and she is not wrong. 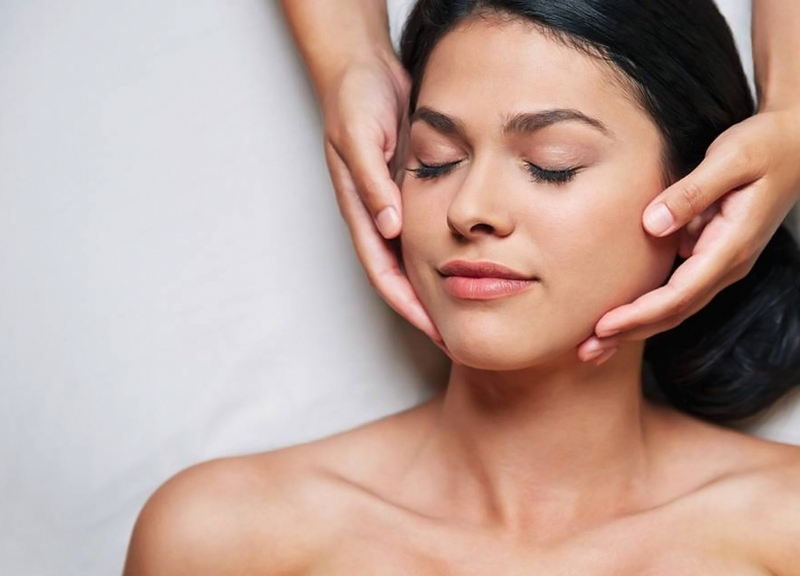 Rejuvenating facial treatments are on offer at the hotel spa. Even more relaxed, I meet my friend for a late breakfast in the Cabana restaurant, next to the outdoor pool. The restaurant’s pergola provides welcome shade, and we settle amongst the foliage and enjoy our iced coffees. It’s no surprise that the service here is impeccable, and our eggs benedict with asparagus is fresh and tasty. Heading over to the pool area, we have just enough time for a cocktail — and then we really must go. Again, our server goes out of his way to ensure we have our organic watermelon margarita and blackberry-infused ‘Midnight Mojito’ in a timely fashion. And as we lounge, drinks in hand next to a pool of azure water flanked by iconic palm trees, we decide we never want to leave.